Police are investigating damage caused to a garage door at a property in Bush Cresent, Bushmills. 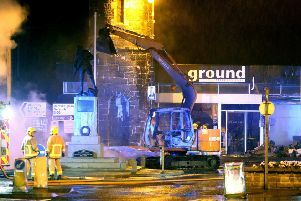 The damage was reported to police on Monday 15 December. Police arrested two men on suspicion of drugs offences following a house search of a property at Stroanshesk Park on Tuesday 16 December. Police enquires are continuing. Police arrested a man on suspicion of drink driving offences following a collision on Tromra Road, Cushendall. Police have arrested a man on suspicion of disorderly behaviour on Castle Street, Ballycastle on Sunday 21 December.